It’s a sparkling feeling, bubbling up inside you. It spills out, and the release is a rejuvenating rush. Laughter revitalises us, soothes us, makes things brighter. And it’s contagious in the best possible way. A group of people gather in a leafy park. There’s nothing funny, but they slowly start to laugh, hands on stomachs to feel the gentle, rhythmic rise and fall. The laughter becomes louder, brighter, bolder – a cartoon “HA HA HA”. After a while, it begins to dissolve into genuine laughter, flowing freely, unstoppably. The group laughs together, huddled in a circle, until it’s time for a deep breathing break. Everyone is flushed, blissful, eyes glittering. In a serious world, a bit of playful release can make all the difference. Laughter yoga is designed to give you that break, combining deliberate laughter and breathing exercises from the yoga tradition to soothe stress, brighten moods and create a lively, social energy. The first laughter yoga club was held by family physician Dr Madan Kataria, in a park in Mumbai in 1995. Today, Dr Kataria heads Laughter Yoga International, a global movement with thousands of social laughter clubs in over 100 countries. Scientists have long been intrigued by how laughter works – why we do it, why it makes us feel so good, and how it impacts our minds and bodies. There’s a lot we still don’t know, but there is some evidence to suggest that shimmering, happy feeling it gives us is real, and could improve our wellbeing in more ways than one. When you laugh, you draw others into that playful, effervescent space. Laughter can be a powerful way to create social bonds, collapsing barriers between people. A 2015 study at University College London showed that people who had a good laugh together shared significantly more intimate information with one another – a key element of strengthening relationships. This social effect is something laughter yoga therapist Mahes Karuppiah-Quillen, President of Laughter Clubs Victoria, sees every day in her work. “Laughter is the shortest distance between people – we laugh with them, not at them,” Mahes says. “It’s universal, without any language or cultural barriers. "When you laugh, you draw others into that playful, effervescent space. Laughter can be a powerful way to create social bonds, collapsing barriers between people." The real magic of laughter though, may be that it just plain feels good. It’s a pleasurable feeling that brings a childlike sense of play and joy to your life, giving you vital distraction from all your worries, and helping you get into a more positive headspace. Mahes is one of the few laughter therapists to have been personally trained in India by Dr Kataria. 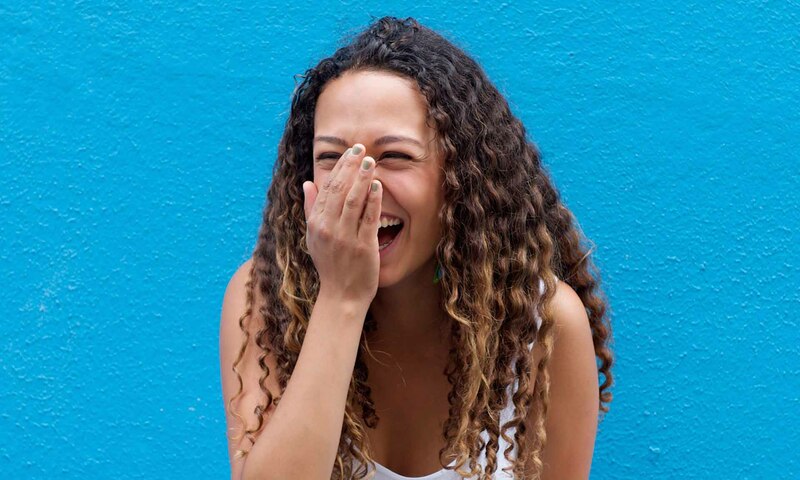 Here, she shares some more on the philosophy of laughter, what to expect from a laughter club session, and how to get into the laughing spirit. Why do you recommend making time to laugh every day? Laughter gives us a natural high and ramps up our joy and happiness meter. It allows us to be naturally in the moment, and live more mindfully and consciously. The fun and play element in laughter yoga allows for the inner child within us to be happy. Everything including work, study and daily chores becomes less burdensome and more fun with the injection of laughter. Laughter also has the potential power to defuse painful emotions like anger, anxiety, sadness, fear and boredom with the release of happy chemicals. Laughter yoga is done in groups, with eye contact, playfulness and instructions on laughter exercise from a trained leader to the participants. It is growing into a worldwide community of like-minded people who believe in unconditional laugher and fellowship. Half an hour is the normal session time. The trained laughter leader who conducts the session gets everyone to start with warming up laugher exercises. For the rest of the time, various laughter exercises are shown for the group to follow. After every two bouts of laugher, a breathing session follows. We end up doing six to eight exercises of laugher in a session, finishing with a positive affirmation. With the 30-minute fun and free sessions offered by laughter clubs, participants take home the healthy habit of deep breathing, with the laughter yoga exercise they come to enjoy. Most often, members go for coffee after the session. How would you describe the group atmosphere? Happy, cheerful, friendly, excited, merry, glad, jovial, exuberant, in high spirit. The idea of forced laughter can feel a bit strange to some. Can you share some advice for loosening up and getting into the spirit? Laughter yoga is based on the belief that voluntary laughter exercises provide the same physiological and psychological benefits as spontaneous laughter. Once you get into the group dynamics and laugh, it becomes easier. For those who find it hard to get started, it becomes easier once they understand the concept and get involved in the happy banter and camaraderie and willingly join in the laugher. Most often, it might just be the first few minutes of indecision, but as the session progresses and the mood becomes electrifying, most people happily join in. Members of the club are good at making other feel welcome and happily support guide the new ones. What are your tips for getting the most out of laughter yoga? Join in with an open mind, be massively curious and be ready to be amused and amazed. Learn the exercise routine, keep coming back for more and enjoy all the benefits of laughter with the happy camaraderie that happens as well. Medibank is proud to partner with Laughter Clubs Victoria as part of Medibank Free + Active – bringing you free social activities that make you happier, healthier and more connected. Learn more and find a laughter club near you.